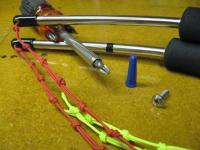 Get an aluminum rod with about the same OD (outside diameter) as your Rev. handles. And cut (4) pieces off it with a hack saw, so they are about 1” long. (The actual length isn’t important nor do they have to be the same size at this stage...just get them sort of close.) I used a solid aluminum rod from an old antenna I found. This is the hard part...drill a 1/8” hole in the center of each piece about 1/2"+ deep. (Note: This can be done after the piece is finished, but I figured if I was going to screw anything up it would be in drilling the hole, so I put that at this stage so I wouldn't be messing up things I put work into.) I did it my hand, but if you have a drill press-or-know of someone who does—that’s the way to go...or...make a bunch of spares, like I did, because the holes of some were off center (see picture). Now stick the piece of aluminum rod in your drill bit, hole facing out, so it is sticking out of the drill 1/4" (measured) and tighten it in the drill bit. Lay you drill on its side at the edge of a table with the aluminum piece sticking over the edge. Turn your drill on and place a file against the aluminum piece that is sticking out. The file will start shaving down the aluminum rod smoothly. The important thing here is to stop every now and then and check to see if it’s small enough to fit into the "debured" end of your Rev. handle. When it is, then do the next (3) the same way (see picture). When all pieces are finished and each fits in the ends of the handle (a little slop is OK), then mark each piece 1/4" from where the size of the aluminum changes going toward the thick end (see picture). Now put one of the pieces into the drill bit, with the small end inward this time, and tighten it in the drill with the mark right at the edge of the face of the drill. Lay the drill down like before and turn it on and put the side of hacksaw blade against the face of the drill and the cutting edge on the aluminum. Now with the drill on, cut through the piece by moving the hacksaw back and forth, like you would normally do, except little pressure is needed (see picture). After all (4) pieces are cut to size go back and lightly file smooth all edges and, using a larger drill then before, chamfer the edges of each hole by hand on the front and back sides. Tie a knot in each leader line, that you have already made up, about 2 1/2", or so, from the end that will be going into the hole. 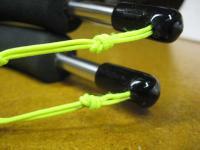 Draw the lines through each hole and pull tightly up against that knot, as you tie a knot in the other end. This will insure that there will be no movement between the leader line and the metal…the knot will be taking the stress, not the line against the metal. Put a drop of super glue on the knots. Holding the aluminum part against the Rev. handle so that the holes in the handle are at the same level as the top knot in the aluminum piece and mark the handle as to where it will be cut, so the point at which the line comes from the handle is the same as it was before--after the pieces are inserted, which would be cutting slightly below the holes that are already in the handles. Cut the handles off with a hack or band saw and de-bur all the edges. Using a two part epoxy, glue the aluminum pieces into their proper places on the handles. Note: There will be a slight pressure within the handle's tube that will cause the ends to slide out if they aren’t held in place till the glue cures. PS Disclaimer: Making this is at your own risk. I will not accept any responsibility for damages caused to yourself, your kites, or your neighbor’s kids!! Absolute proof that a picture paints a thousand words. And that the proverb "Wet / No wind Days, make idle hands produce interesting and useful additions to youe Rev kit"
"Keep it up" to quote some famous bloke. I used some elongated beads I have, that I used to make malas with. There made out of the human bones of a long departed Japanese Zen Master (道元禅師). The good thing about using bone beads is that they can be filed by hand and they already have a hole through the center, which makes it a lot easier to work with. And being the bones from a departed Japanese Zen Master...well...why not!! I figure I need all the help I can get out there!! heehee!! "No! "...heehee!...I just made up the story about the bones of a dead Zen Master...that's funny! They are bone beads though, but probably from the part of the steer that didn't reach my table when I ate out last week!! Yes...getting the ZEN...is located "way" back in my mind as, "Things to do before I die!" But, I have to get a "Full-Vent", to work with the "more wind" times...&...let the "less wind" times pass for awhile, at least until I learn how to fly with the wind first!! heehee! What would have probably been easier, although I didn't think of it at the time (because it was too simple, I guess), would have been to just cut a piece of aluminum rod about the same size as the inside diameter of the handle tube and, maybe 1/4" to 3/8"long...drill a hole in it, (tie the leaders to it) and then epoxy it in place flush with the end of the tube. But, that's too simple and I wouldn't have been able to take all those instructional pictures!! heehee! Looks great, and gives me some real ideas, for sure. I'm assuming, that in your original description, of your creative process, when you referred to putting the piece into the drill bit, you actually meant, that you were putting it into the drill "chuck". Is that correct? Not meaning to be critical in any way, and for sure, I realize that everyone doesn't have access, but these inserts could be made very quickly, and with much greater accuracy, on a metal lathe. If you know someone that is skilled with a lathe, you could probably get them to make you a hand-full of those inserts, for little of nothing.........eh? Never know when you might need a spare, or another set. I only have one question - What do you do, if you need to replace the pigtails? Just curious, because if I understood completely, once you epoxy the aluminum inserts, into the ends of the Rev handles, you can no longer access that inside knot, which holds the pigtail in place? Am I correct, or did I misunderstand your process? I suppose you could use something very strong, that you know will never wear or break? "Chuck!" Yeah! !...that's what it's called! Thanks for complement and the correction! I only have a few hand tools and have little experience beyond a drill and a hacksaw...so little I don't even know what the parts are called! heehee! 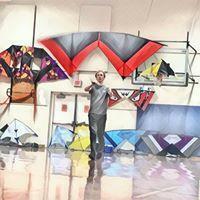 But, now that I'm freshly retired, when I'm not kiting, I have to figure out something to do so I don't go crazy!! Thus...a variety of projects have come into my life. And on replacing the leaders...I, hopefully, won't have to do that often. I use 150# spectra, sleeved and double it. Then I tie all the knots, color them with different colored permanent markers (because I can't count to ten anymore) and put a drop of super glue on each knot, which makes them like little beads. I like the thicker leader, so there is some bulk to lark head to. But, I figure if I had to replace the leaders...I'd have probably two choices. Heat the end to destroy the bonded glue and wrestle the plug out with pliers...or...drill it out. Neither of which sound good...but, it will give me something to do when it rains again!! heehee! If you have the tools, I suppose you could thread the ends and use some type of lock-tight on the threads so they wouldn't come loose. But, I'm sure you know more about that then I ever will!! heehee! When you put "your" ideas into making something...please, post it so I can learn! Thanks!! All I have to say is "YES"! "and "Thanks" You're a couple "light years" ahead of me!! But, That's cool!! In my doing "my" thing...and making it public...I got to learn better things!! That's Great!...the lessson is, "for anyone out there", just express yourself...no matter how stupid it might seem...and only "Good" will come out of it at "Kitelife"! One thing that certainly suprised me, and you confirmed it, is that the holes drilled in the "store bought" handles must have been drilled by drills that had lost their edge many "years" ago. The burrs and sharp edges, after taking the rubber cap off, could be deadly!! heehee! Matter of fact, I couldn't figure out how the caps were held on so tightly at first...I figured they might be glued on...but, no...the burrs were cutting into the rubber, some 1/8" high. heehee! (But, then again...I suppose that's a good way to keep the caps from sliding off)...the problem only comes up with people like "you modification guys" or "my rainy days" and we get to playing with things!! heehee! PS I'm getting pretty good with the old Rev. lately...heehee! I really want to thank you for all the great information! It will make my next rainy day more productive!! heehee! And one thing for sure...1/8 to 1/4 of an inch..."ANYWHERE!!" isn't going to change anything in "MY" Rev. World!! I just got to looking at this topic, looks awesome. Over the years, I've become *very* particular to the exact thickness (diameter) of the grips... In order to preserve this, I had my friend Walt modify mine in similar fashion. Mine still come out the front of the rod instead of the end, as I'm so active with my hand movements, I thought it'd wear less. Having the leaders come out of the ends of the caps, do you find it promotes more friction/rubbing/wear? Here's a the small video that is mentioned in that Revkites thread for ease of access. The added length drives me nuts, right along with the diameter... But it's all about personal taste. OK Duane, you've got the Pros in here now - listen up - these guys know what they are talking about. As for me, I'm just a tinkerer, with a bit of mechanical knowledge, and the tools to back it up. I really enjoy improving, improvising, and revising, already great ideas, and there are tons of them out there. If only I could fly a Rev, so well. As for the "Watty Way", my mistake (sorry Watty, but you did make the video), and I suppose that is what I remembered. I do remember that the original idea came from, "Stone in the Shoe Bob", so credit given, where credit is due (sorry Bob). 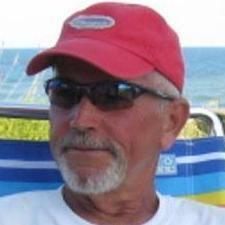 No harm intended, only thanks - Bob, thanks for the idea - Watty, thanks for the video. As they say, a picture is worth, well, a lot. Ok, so now it's the "Stone in the Shoe Bob" method. Either way, thanks guys. Now, as JB has pointed out, the length issue is probably a personal preference. I'm sure that for the seasoned Pro, the slightest change in length, and/or diameter, is extremely annoying, however, for the novice / newbie, it may not be, quite so critical. I would suppose that whatever feels comfortable to you, would surely suffice. I hope JB will agree with this. So, as for the dilemma, "Do I cut the handles down to the original length, or do I let the length, fall where it may? ", my advice on that would be to fix a set of handles, using the "Stone in the Shoe Bob" method (as illustrated in the "Watty Video"), then take them out for a flight, or three. If the length feels too long, awkward, or unwieldly, then it's simple enough, to go back to the work bench, take them apart, and cut them off at the inner edge, of the original holes, where the rings used to be attached (side of the hole, closest to the grips). After the cut, smooth off the rough edges, ream out the ends, and reassemble everything. This should put you back to within 1/16" to 1/8", of the original length - Voila! No snag handles, original length !! I was reading about your handle modifications, using the drywall anchors and the screws, which would enable one to rid themselves of those annoying metal rings, on the ends of the handles. A while back, Watty Watson sent me a video that he obviously put together, to help me understand his explanation of this procedure. I thought it worked like a charm. Now, I see, where you have now, gone back and reversed that modification, on the upper ends of your handles, and reattached the metal clips. I believe you said this was due to the additional handle length, which is created, by this particular modification. Now, I've got a stupid question. If this additional length is a problem, why not just cut off the top end of the handle tubing, maybe .25" to .50", or whatever seems to be right, and put you modification back as it was. 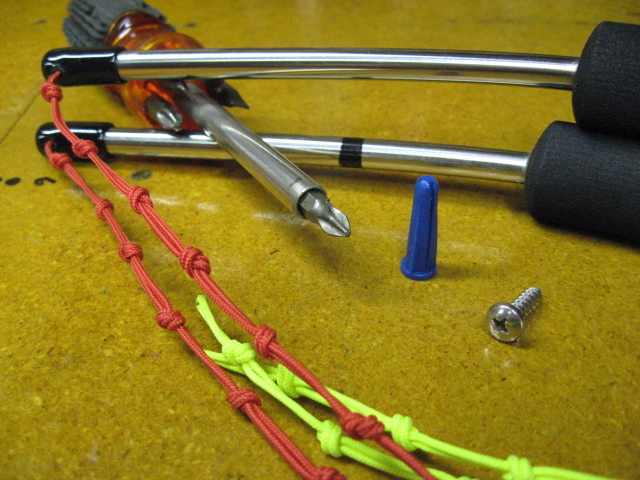 I mean, that is such a clean and trouble free modification, and those clips (hog rings) are really a pain. My thoughts would be to cut the tubing, immediately below the holes, where the metal clips were mounted, and then reinsert your anchor and screws, as you had previously done. This should put you back, very close to the original handle length (+/- 1/8"). Surely you've got several sets of handles, just lying around, that you could experiment with. I hope I haven't misunderstood your point, but I think I'm hearing what you were saying correctly. Just my thoughts on the issue. Also, as for me, I suppose that I'm not quite as tuned in on the Rev, as you may be, and obviously, I haven't been flying long enough, for that small amount of additional length, to be a bother. Maybe one day, I'll get to that point, but for now, I'm just very happy, with your idea. Thanks for sharing it ! Does anyone have tips for how to tie precisely spaced knots for the pigtails besides just using a rule? I have heard something about a "nail board" or some sort of fixture to tie the knots. Heard of, never seen. TK uses some sort of jig to do hers and they come out sweet!! 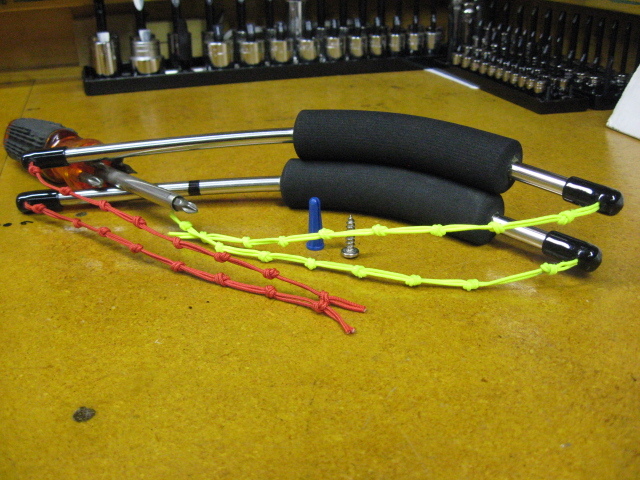 Here's the Jig I designed to tie my bridles.. I can tie all three bridles on the same jig by looping a few strategic places.. No loops gives me the 72" LE or Rev II size which I use the most. Other strategic loops give me the standard 1.5 size, 84" size or the 97" LE Bridles I tend to like as well. 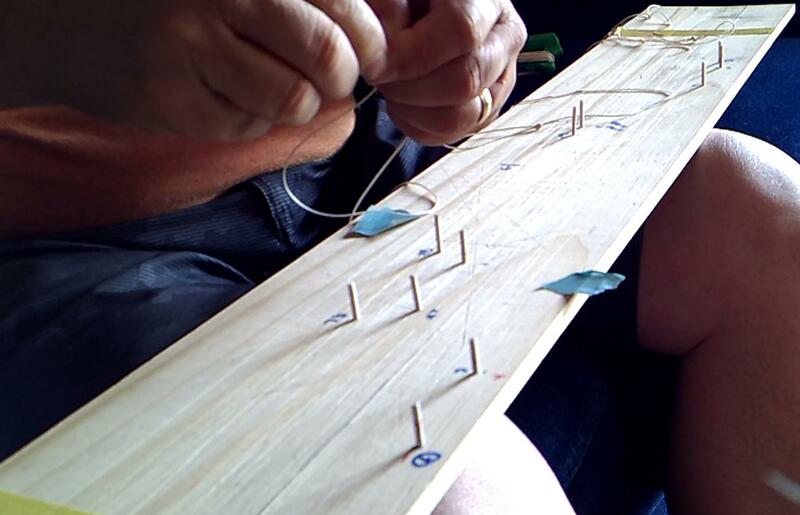 The board is a simple pine craft board.. the holes are drillled to fit Q-Tip shafts.. 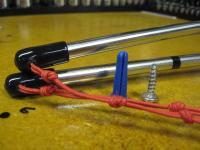 I wrap the knot areas, mark them with a sharpie marker and then tie them off. 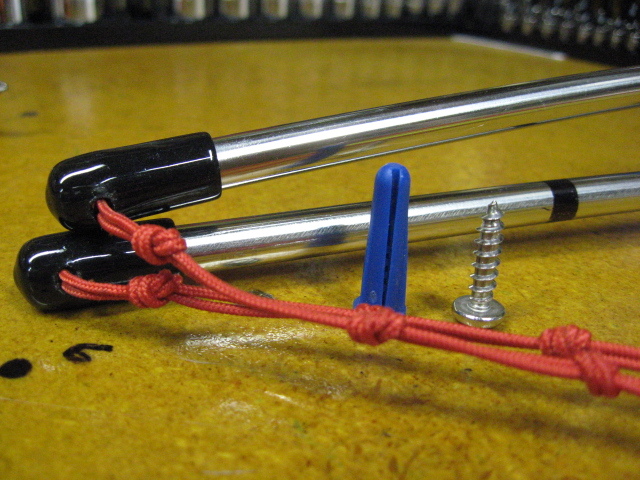 The same principle is applicable to any knot based system requiring repetition like Leaders. there are a few additional tricks to increase consistency but it's really just paying attention to the details and keeping the tension at all points the same. The back of the board has my marks for patterning Leading Edge for 72", 83' 93" and 97" Kites. Anyone will probably show you their bridle and/or leader jig.. No one will show you their dimensions or let you" measure them".. Can you blame them?? 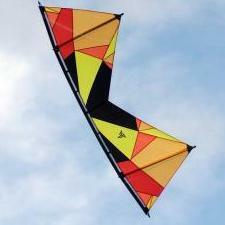 I could not make a kite without this board. it gets used for at least 4 different steps. 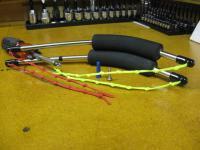 I will also share a picture of my jig when I am successful. I am very accurate with tying and spacing my knots under tension using a rule and marking the knot tying points but it is very tedious. 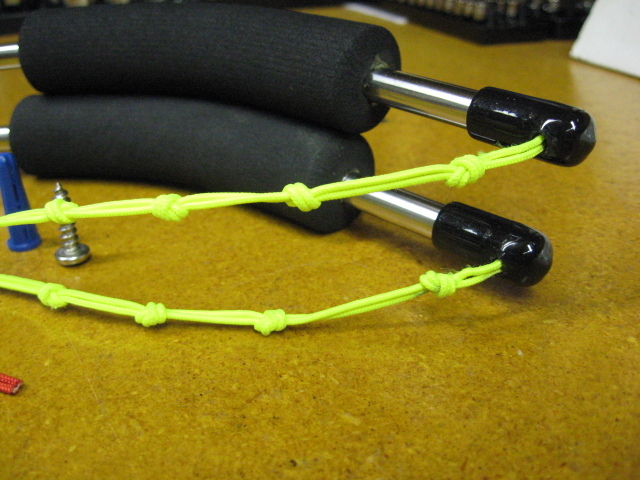 And matching identical knot assemblies such as a bridle or leader requires some adjustments afterwards if there were slight errors. Perhaps the jig can make my process more consistent.